My name is Agnete. I am 53 years old and due to health problems not working but staying at home for a regular basis. I am the type always having new plans and ideas, and since you will be spending most of the time with me, you will meet various tasks regarded to the house and garden. I am an outdoor person, and gardening will be our main thing from the snow leaves until it shows up again. I am interested in learning new things, and next I want to learn is about harvesting and use of wild edible plants and permaculture growing. From summer 2018 I started as a beekeeper, having my own bees. If you are allergic to bees or afraid of them, please tell me so while you can come along caring for the bees, but you do not have to. I am living alone since my two sons have moved out and are living in Oslo and Lillehammer. I love travelling and meeting new people. Winter 2018 I spent in Australia as a workawayer myself, and now I love bringing the world and people to my home. I have several year experience with house exchange, and I also rent out a room for short terms. In a separate apartment in the house Jannike lives with her two dogs. In theory she is not a part of this deal, but in practice she is a part of our everyday life too. She is a nice person who loves company while walking the dogs. This is a calmer part of Norway. We do not have the high mountains and the deep fjords. This is a more wavy landscape, but we are situated along the largest lake of Norway, Mjøsa. This is in the middle of farmland, with several organic farms in the area. Around the house it is open and airy with fields, fields and fields, but you will find the forest just a small biking trip away. There are several good opportunities for walks and for biking. On a personal plan I am happy to share with you my benefits from life. I can teach you vegetarian cooking, vegan cooking and about Raw Food. I can teach you hobby gardening and how to grow and maintain your own veggiegarden and greenhouse. I can teach you how to knit. I can teach you to saw with a sewing machine. We can do both quilting, smaller things for the house, make new clothes, but more fun is to do redesign of old clothes. If you want to do scrapbooking/making gift cards or do decorative painting I also have equipment and experience with that. I am just starting keeping my own bees, so you are welcome to come and learn it along with me. The bees have the highest priority. Both regular bees keeping, but also cleaning, building and repairing equipment. And in early fall it will be collection and extraction of honey. In spring I would like help in the garden. I love to grow, and I want to spend most of my time outdoor. My main interest is all edible, both from the vegetable garden, greenhouse, bushes and trees. My philosophy is to get as much out of it with as little effort as possible, but I am not afraid of hard work and I always have some new projects. In fall I would like help harvesting from the garden and the forest. We are picking berries. My garden has rasberries, plums, cherries, apples, pears...etc. and we will also go to the forest to pick berries. I usually pick above 100 kilos of fruit and berries to put in the freezers for the winter. Wintertime is when my health is getting worse, and I am closing down for a quiet life. But during spring and late fall, and on rainy days I would like help painting indoor. The house is made of all wood, and after some years it would be nice with some color. We are painting with Livos, natural paint blended with beeswax so it will not harm your health. I have two rooms available. One larger room with a double bed. The smaller room is with two single beds. 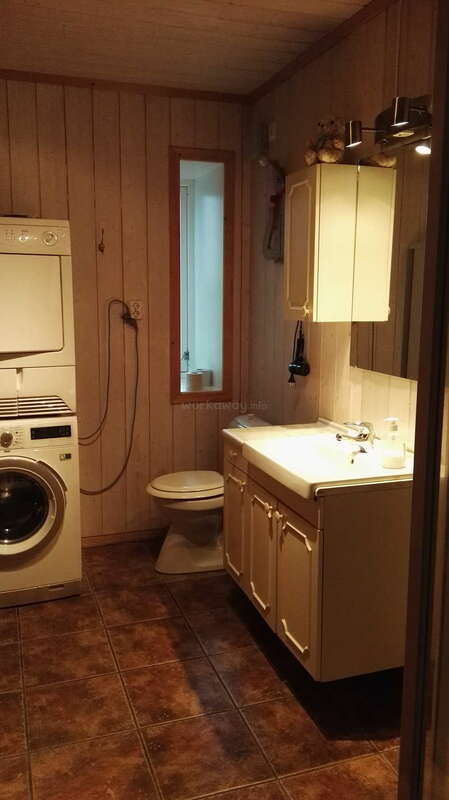 It contains just beds, a closet and a chair. The bathroom is shared between workawayers, sons staying at home at the moment and bnb-guests. Your free time is your time and if you give me your preferations I will help you planning. From the house there are busses running just in school hours, but both busses and trains are to be found at Stange 3 km away. Stange: 3 km away. Stange is just a small village, but is has what we need for the daily life. Hamar: 12 km, and 10 minutes by train from Stange. Hamar gives whatever a city has to give. The airport of Gardermoen is 50 minutes away by train. Oslo: 120 km, some less than 1,5 hour by train. Lillehammer: 1 hour by train and one hour by car. The shores of Lake Mjøsa: 3 km. I will not lend you my car, and it is unfortunately just for two, so if we are more people I will not even be able to take you anywhere. Instead I have a bike for you to use, and even a bike on winter tires. Several nice hikes, both in the open landscape and in the forest near by. Biking trips are easy since there are no real steep hills around. In wintertime it is possible to go skiing, bot cross country and slalom. Cross country is not as far away and will be a free activity if the skies and boots I do have fit you. For slalom we have to go to either Budor or Trysil, and it is quite expensive. I will have brouchures and some ideas about what to do while you are staying here. Dalsnibba - Geiranger - Trollstigen - a roundtrip made in two days. This is me. Here boating on Lake Mjøsa one summer night 2018. Indian meal by workawayers Mandeep and Samorjeet. From left friend Janne, workawayers Arnod and Marina from France, me and then Mandeep. 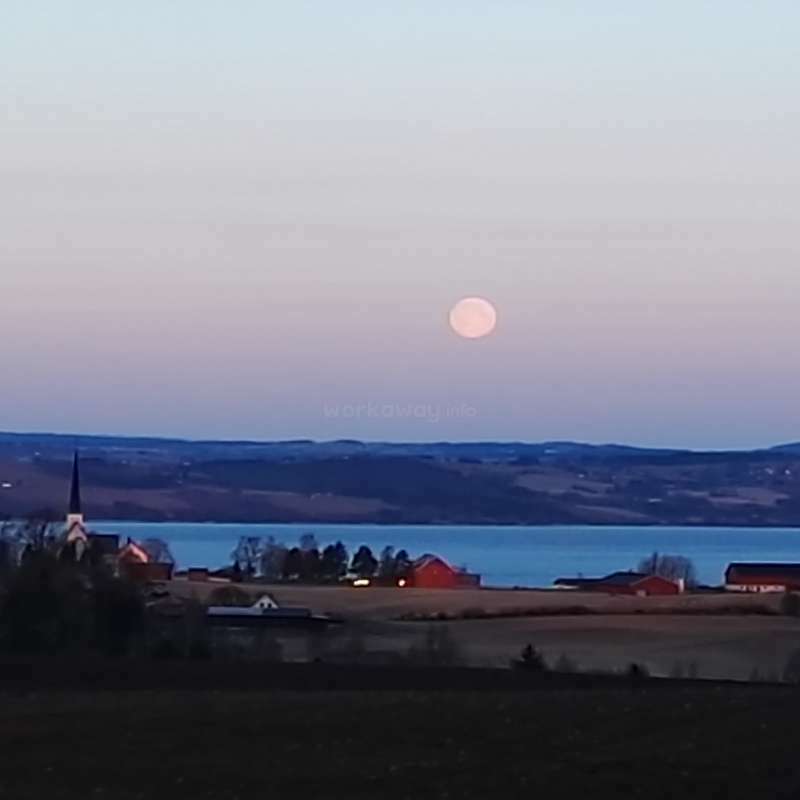 Full moon over the landscape of lake Mjøsa. The house is 700 meters to the left of the church. On a walk overlooking Lake Mjøsa. Workawayer Nina and some Norwegians are entering Lake Mjøsa in March. I spent two weeks in march at Agnete´s. I really enjoyed my stay, the work varied between home and outside work. Agnete is a very open and cheerful person and she is the best cook ever! She took me iceswimming, skiing and she told me about good hiking tracks near to her home. Jannike (the neighbour) is also a really nice person and it was always… read more fun to chat with her or to join her walks with the dogs! All in all I can just recommend Agnete, I had a great time! Nina was a nice and quiet company in my house for two weeks. She did some good work. She met several tasks she had never tried before, and the work was done with the best result. She was really quick in melting wax into the frames for the bees, a job that requires patience and precision. Also outside work Nina took the challenges she met with… read more great enthusiasm; she came along ice swimming in 2 degree "warm" water, and also went skiing for the first time. At the beginning it was supposed to be only two weeks. We did not expect that we would spend almost six weeks at Agnette's home! It was a good and very varied time. The work was straightforward and enjoyable. We performed various activities inside and outside the home such as painting, cooking, helping with a bee project, snow removal and small… read more work around the house. It was also a time full of attractions. We went skiing. We were swimming in the lake (ice- swimming :). I tried sewing and many other new things. Agnete is an open and positive person. She is close to nature and has a lot of knowledge on various topics. She is a great cook with a lot of attention for organic and healthy dishes. Although there was still a lot of snow outside the window, we spent a very warm time. Every day spent in this house was UNIQUE! Jacob is a clever and interesting person and I really liked having him around in the house. He is a good cook… read more and spiced up my meals, but even better when he gets to do all the cooking. Jacob also takes a challenge and came along ice swimming - twice in just a week. You are welcome back any time Jacob!! - and I surely can recommend him to other hosts. Thank you Agnete for a wonderful (although too short) week in Stange in January! It was the perfect end to my semester in Norway. This was my first WorkAway experience and I couldn’t have asked for better. Agnete is a remarkable woman with the vision and whimsy to dream up all sorts of projects, and she has the rare tenacity to actually see them… read more through to completion. You won’t regret coming to help out with her work, which depends on the season and is pretty flexible. I helped insulate a wall, fixed up some bikes, shoveled, cleaned some windows, and repaired a fan for her neighbor Jannike. Agnete is a great cook (very healthy too!) 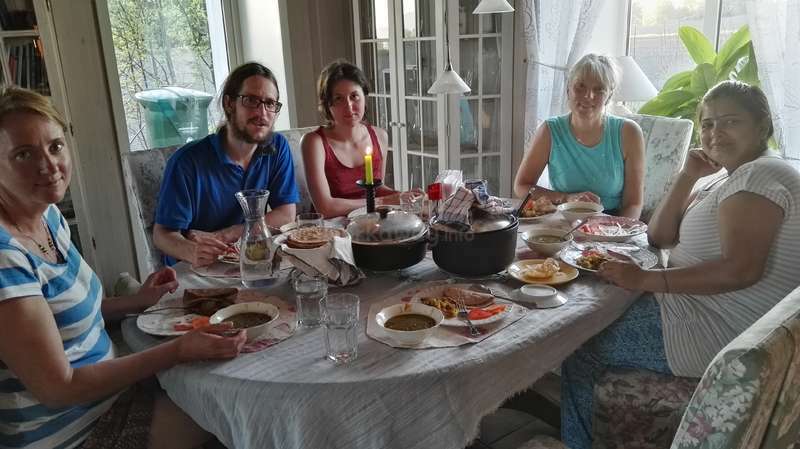 and I was able to learn so much from her – about raw food, foraging, perennials, gardening, beekeeping, and the Mjøsa area. In our free time, she was kind enough to bring me to pick-up volleyball, yoga, an art exhibition, and ice-bathing in the lake. I didn’t take much time to explore the nearby city of Hamar, but I was much happier instead to go cross-country skiing around the groomed trails in the area. I felt at home right away, and you’ll find Agnete to be an honest, open, and friendly host. I wish I could come back in the Summer to work more with the garden and bees! Thanks again Agnete and best of luck with all your adventures in life! Emma stayed with me for two weeks in Desember. She is a joyful spirit that is fun to have in the house. She also did a great job in the big cleaning we did both inside and outside the house. 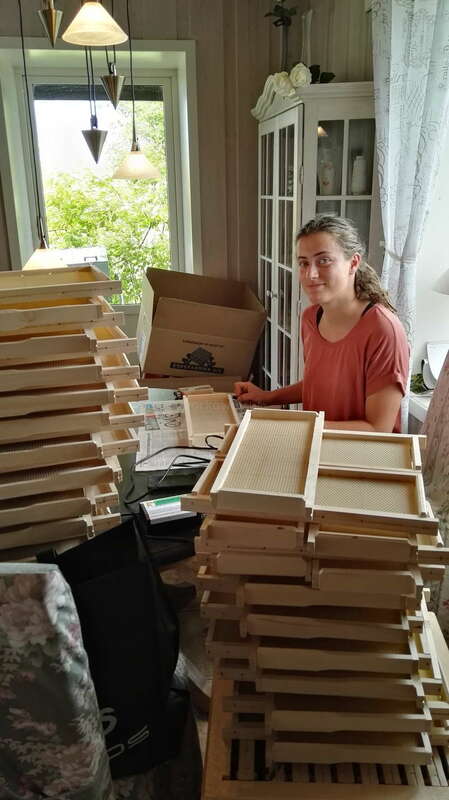 Also more precise work as melting wax into frames for the bees, she did with the best result. I will give Emma my best recommendation for future hosts. Marie stayed with me for two nice and fun weeks. She did a really good cleaning job while the house was all dusty from tearing down a brick wall, and we had to clean absolutely everything. Marie is fun to be around, and we had many good conversations. Being fall and short days, we decided to work longer hours when working, taking one extra day off… read more to be able to benefit from daylight on our free time. I think it worked well for both of us. I can warmly recommend Marie for future host! I have spent two weeks at Agnetes house in November. My time there was really great! Agnete is a so nice person and always in a good mood. She showed me a lot from the surroundings and take me with her to so many activities (volleyball or to Hamar to a Christmas-market) We had such great conversation and I felt really welcomed in her house. The… read more work is not hard. I cleaned the house and had some small tasks outside. I should take care on my working hours by myself. The bees are already taken a “winter-rest”, so that was not a big part of the job. As I said, my time in Stange was great! I would definitely recommend her to everyone! Cindy and Daniella stayed for almost four weeks and was a great help and contribution for me, my wintergarden project and honey production. It was some really hard work, picture yourself tearing down a brick wall to put in a door... Daniellas labels for the honey are just fabulous. She is a professional, and I really look forward to start using… read more her labels. Cindy and Daniella complement each other and makes a good team. They are eager to learn about everything in society, and it made me think about how things work to. They are really nice people and I enjoyed having them around, I miss you guys! Hannah is interested in what is going on, and to discuss… read more and to learn, and she makes an interesting conversation partner. I am very pleased having Hannah staying, and I can warmly recommend her to others. To Norwegian hosts: Hannah skal bli i Norge ett år og hun vil lære norsk, så vennligst hjelp henne med det. Wow, thank you for this amazing three weeks! Agnete was the first host I ever stayed with, the start of my long Norway-trip, and I am so grateful that I have met her! I felt like being part of her life from day one, when she took me to the library to get Norwegian study-books or when she drove with me to a sing-along in the neighbor church. I have… read more met her parents, brothers and one son and even if I could not understand much of what they were saying to each other, I felt welcome and warm. Agnete gave me the opportunity to see the most important places around, took me on a biking-trip in Hamar or left me for a solo-hiking to Tangen. Thank you very much for this, Agnete! There was always something to do. Agnete is just like her bees: always on the go, working here and there, her To-do- list will never get shorter! The tasks were different almost every day. We built isolation for the bees and cleaned older parts of the bee-boxes. Then we painted them and a part of the new wintergarten, fixed a bike and got the wood ready for the winter. When Cindy and Daniela from Columbia arrived last week, the tasks were mostly around the wintergarten and we finally finished the floor there. 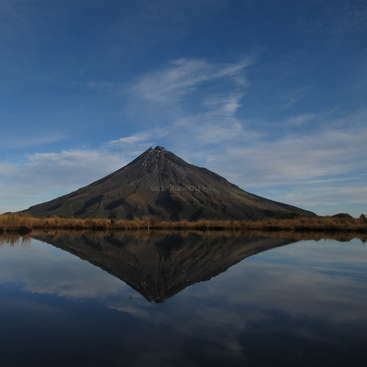 We had an agreement, that we will work for longer hours but have an extra free day every week to explore the surroundings. I am not a vegetarian, let alone vegan but I could adapt to Agnete's eating-habits very easily (she is not vegan, but most of the time you might eat vegan meals). She cared about what I liked and what I didn't (sorry, that I am not able to eat that spicy! ), and even after she said, she didn't like to cook, we did the meals together most of the time. I learned about Raw food and soups (it's soup-time guys!) and the most important rule: Always use ginger and garlic! We often spent the evenings for ourselves, but from time to time we sat at the table a bit longer talking about this or that or even founding a bakery-factory (Raw-food-bountys are the best!). Agnete encouraged me to learn the Norwegian language and even if we didn't do as much as we wanted to, it was nice to know, that she was supporting me. Jeg skal lærer norsk til vi møtes igjen! To summarize this novel: I can recommend Agnete to everyone, who wants to get out of the cities and right into a heartful home! Thank you Angete for everything! Jenny stayed for 10 short days. 10 nice days that just flew by. Jenny was really a great help with all the apple projects, the aronia picking, and picking from the garden. Jenny has a really pleasant personality, she is easy and nice to be around, and work was just a pleasure together with her. Hei! It's been so long! I'm Antonio and I owed Agnete my comments, but 2 days after I arrived in Spain from Norway I got involved in a new and overwhelming project that had me hooked up until this week. Thanks to Agnete, my impression of Norway is 5 stars, that is, great! I can only give good references about her. I felt like home. She interested… read more for me and my hobbies and helped me to organize all kind of activities for my free time. I coincided with Anika and Lucas as you can read in their post, great guys! I wish I would have learnt more norwegian to be able to communicate better with Agnete and the rest of the people I met in Norway. She introduced me to her friends and family what made me feel very comfortable. She took me to a fair at a norwegian school, so I could see what it looked like (something I was interested in), she also took us to a nice long walk next to the lake. 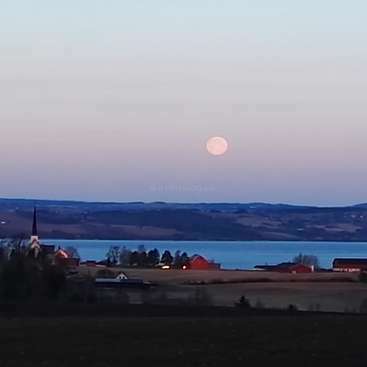 I could easily go to Hammar and visit historical sites, go to a concert in a beautiful church and visit farmhouses near the house. She also took me to Oslo, which I could explore for some days and I will always be grateful for her helping in logistics and accomodation for those days. She reinforced to me the idea of eating excellent vegetarian, vegan and raw meals. My eating habits were changed for good, I lost some weight and felt in greater shape! I will never forget Kombucha drink first thing in the morning together with Agnete's smiling face telling me to drink it because it was good for me, and indeed it was! I also came up to meet Greta, fantastic girl who who of great help for Agnete and me (because of her English language skills). I would like to extend my gratitude to Jannike, (a little angel), for her help and kindneess, to Elenne, always smiling, to her brother and his family, to Agnete's parents and Anne and Line, all who I had the great pleasure to meet. I spend three weeks at Agnetes place and it was a wonderfull time!! Agnete has a lot of ideas and projects in the garden and for the bees - all at the same time. So every day we would see what has to be done and what we would like to do. She is open to ideas and people with individual skills. 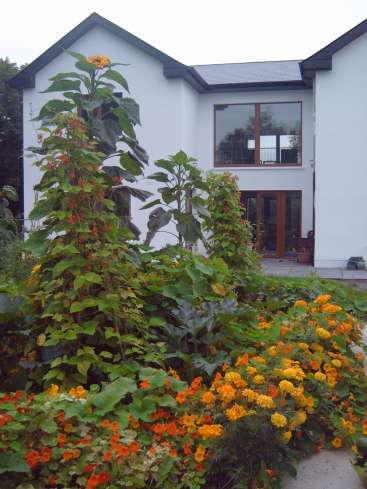 If you need a struktured and fully pland day, this… read more is not a place for you - but if you are looking for a welcoming, healthy home with a host that is full of positive energy, this is just the place for you to be. Thank you Agnete and Jannike for this wonderful time and all you have been teaching me. 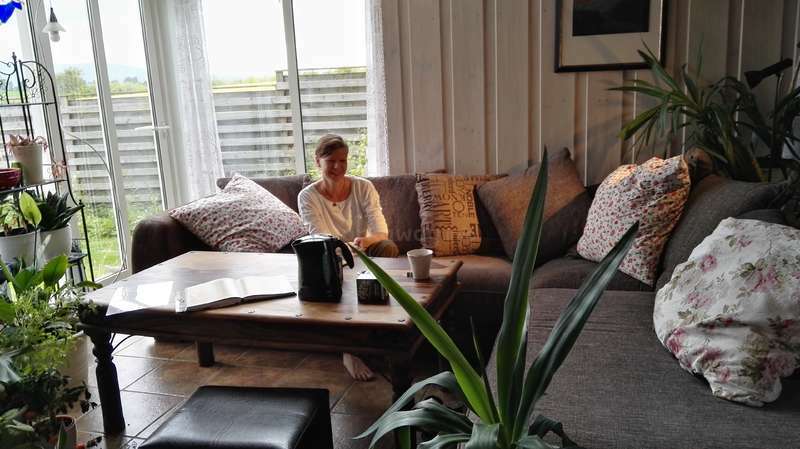 We stayed with Agnete for 2 weeks in June and really enjoyed our time there. Agnete is a very hard working and energetic person. She has so many creative ideas for her gorgeous house and it was a lot of fun for us to help make them a reality. We helped with gardening, a few building jobs around the house, and setting the foundations for the… read more winter garden project. The house is also located in a fantastic place. A short and beautiful bike ride to the nearest town (Stange) and also a short bike ride to the lake. 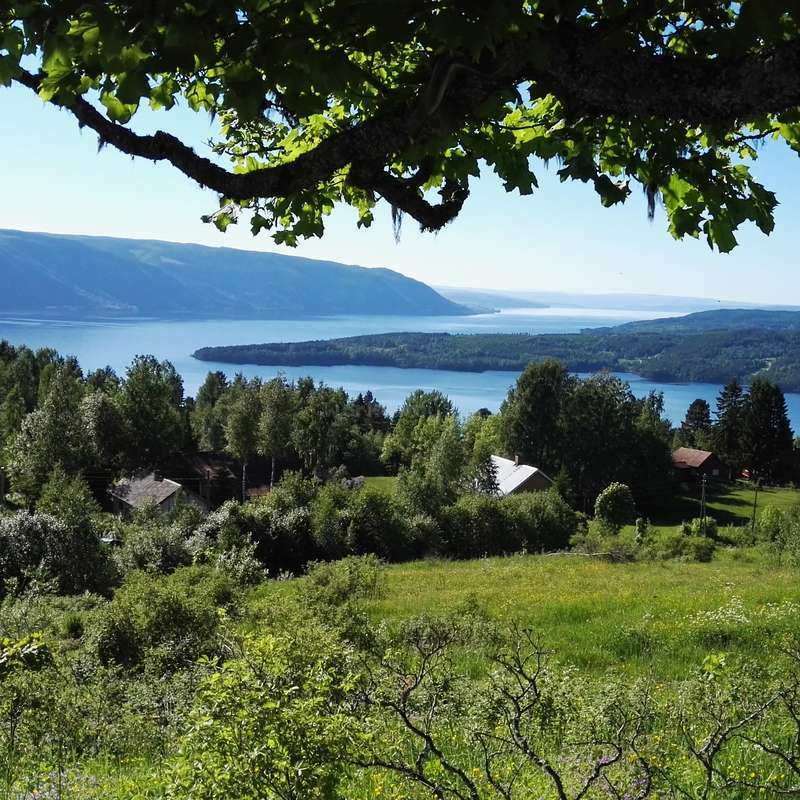 We would definitely recommend this workaway to anybody wanting to see the beautiful landscape of Norway, and of course, meet the amazing Agnete! I will be thinking of you two every time I'm sleeping outside on my balcony. And especially when it starts raining and I do not have to rush inside - your roof is just perfect! And they did also build more, a small roof above the entrance door, and a "doggie house" for the automatic lawn mower. They… read more make such a great team, and what they build is strong, solid and good looking. Besides the building, they also helped me with some heavy digging and preparations for my wintergarden, but I wish I had something to be decorated while Camerons carving just is incredible. Rachell and Cameron is also nice and easy people to have in the house, and they make interesting conversation partneres. Future hosts should not keep them just for their work ability. It is some bright brains here,… read more and it will give you interesting conversations and new ideas. Thanks's a lot Marina and Arnaud! 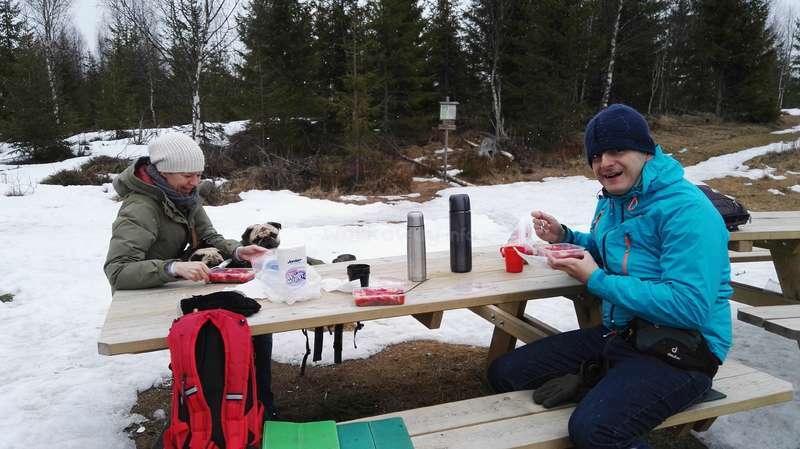 We stayed two too short weeks at Agnete's home, and we wish we could have stayed more. We had a really wonderfull time spending time with her. She is a very nice person who has a lot of energy and tons of projects ! She made us feel at home immediatly and prepares a lot of very good smothies. She is really flexible about work and is very… read more open-minded to new ways of doing things. It was great to spend time with her discussing about what to do next and how to do it. We made a lot of different things such as sand digging, bee keeping, earth digging, vegetable planting, gravel digging, painting, and some more digging ;) We hope your winter-garden will be ready this fall ! She and Jannike gave us a lot of tips about what to do in the area and in Oslo, and we all went walking in very nice places with the two cute dogs. Their life-style is very healthy and "green" and it was a pleasure to share with them about that. This was definitely the best workaway we did. Thank you Agnete and Jannike for that. PS: if you are allergic to bees, warn Agnete immediately ! Lucia is the sweetest girl ever. We did some good work done, and her smile and enthusiasm brightens the days. Lucia is eager to learn and eager to help, and when returning from a walk or a biking trip, it is with stars in her eyes. If I could I would have kept her. She stayed for three weeks, and thought it was not easy all the time Greta kept the good mood, patience and spirit. Her main challenge was to be the link between Antonio (who came here to learn Norwegian without any studying on forehand and hardly knowing English...) and the rest of us. For… read more three weeks Greta was a split person - half Spanish, half English ...with a touch of Norwegian. Thought she had no intention to learn Norwegian, Greta picked up words and conversations scary fast. Besides the language mix we did a lot of work, and Greta is a hard working person, always in front of the tasks thinking of what's next. Greta is selfmotivated, able to pick up and do whatever needs to be done at the moment. Greta was a great contribute for both me and Antonio these three weeks. I wish her the best of luck. For all future hosts: please help Greta to be able to finish her education and to fulfill her dreams - Greta deserves it, and the world needs people as Greta. We stayed with Agnete for 3 weeks and really enjoyed it! Agnete is such a friendly, openminded and funny person so you love her from the beginning on! We lived in her comfortable house and felt like home! We also enjoyed the daily long and good breakfasts with selfbaked bread and very nice smoothies. The work was not too hard and Agnete gave us… read more the freedom to do the kind of work we wanted to do. So we worked the most time in the garden but sometimes we were also responsible for cooking. There she showed us some great vegetarian, vegan and raw-food meals. She gave us a lot of information about what we can do/visit in and around Stange. And we also did a great hiking trip on our last day! The countryside is great and Agnete gave us bikes to explore it. We really recomment to stay with Agnete. It's just fun and relaxed staying and working with her! Thank you so much for the 3 weeks with you and also your neighbour Jannike! Annika and Luca are good workers and they helped me with garden construction and some serious stone work. Both of them are self going and spoiled me with dinners ready on the table and housework just disappearing.… read more Luca was always willing and did a great job in translating to/from Spanish whenever Workawayer Antonio and I needed a "moving dictionary on two legs". They both also picked up quite some Norwegian from my lessons with Antonio, and we had much fun. Besides all the good work I also enjoyed having them in the house. Such happy and positive people is a pleasure to be around and they enlightened the grey days this late fall. I will recommend Annika and Luca to any host needing good workers and positive energy. And you guys are welcome back any time! You for sure have to be back in the spring to check out the winner of your blooming competition. Sergio stayed for two weeks to learn Norwegian. He is a quick learner both due to the language and to the tasks we did. Sergio is used to work, and he is not afraid of some hard work. He is a social person and likes to work and to be together with someone, while being left alone for days he was not as happy. While learning the language quite… read more quick, I wish Sergio good luck finding a paid job in Italy or in Norway. Adam stayed here for three months to learn Norwegian. Adam was my first workawayer, so poor him got to help on all the hard jobs that was just too much to start on by myself... Adam is a quick learner, both due to the language and to the jobs we did. As a city boy he got to try several new tasks, and he was eager to do them exact and right. Adam… read more is an independent and selfsuported person, and we did not follow any hours. We worked some long days while Adam left to travel other days. He had days off to spend with his friend visiting from Poland, and I did also leave for extended weekends while Adam stayed alone in the house. Both of us are flexible, and it worked just great. Adam is much aware of other peoples needs, and it is just a pleasure having him in the house. I can warmly recommend him for everyone considering housing another person! Agnete is a wonderful host. The time spent in her home was unforgettable for me. 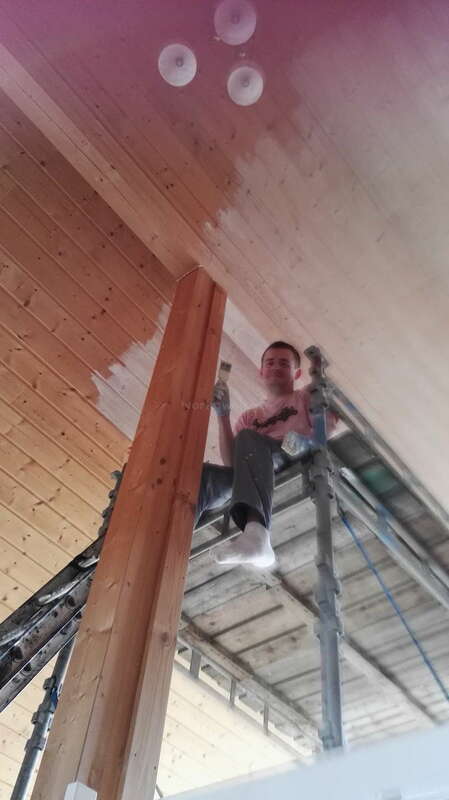 It was my first workaway experience and first opportunity to paint the house and help in other renovation works. I was also helping my host in the garden. 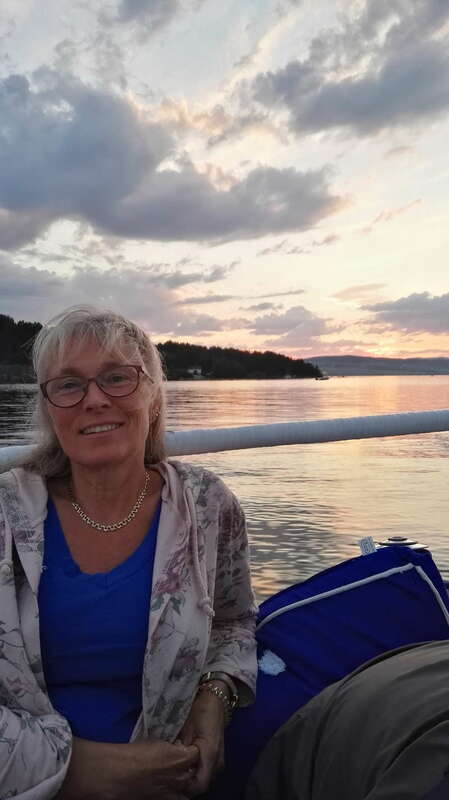 Agnete is a very helpful person, thanks to her I could easily learn and develop many skills, as she showed me… read more many useful ways of performing renovation works. When I did something wrong she was showing me how to repair it. Agnete is also the master of healthy and tasty cuisine. She cultivates in her garden plenty of vegetables, used then to prepare good meals at home. She is also preparing good, healthy, prepared only from simple and natural ingredients cakes, chocolates and other sweets – they were really delicious, so I got used to eat only natural, home made sweets. When I came back home to Poland I still keep on preparing my own chocolates and cakes according to Agnette`s recipes, cause I do not like industrial sweets anymore. My stay at Agnete`s home was not only connected to work. It was a true work and travel experience as I had also an opportunity to see many nice places, ski, ride a bike, hike in the mountains and much more. I`d like to also express my sincere gratitude for the time, Agnete spent giving me Norwegian lessons, as one of the purposes of my Norwegian stay was to learn the language. I am very grateful and happy that I had an opportunity to spend time with Agnete and her family during the spring 2017. NW Ecuador Coffee Farm Retreat in La Carolina Parish of Imbabura. Dive into the coffee culture!